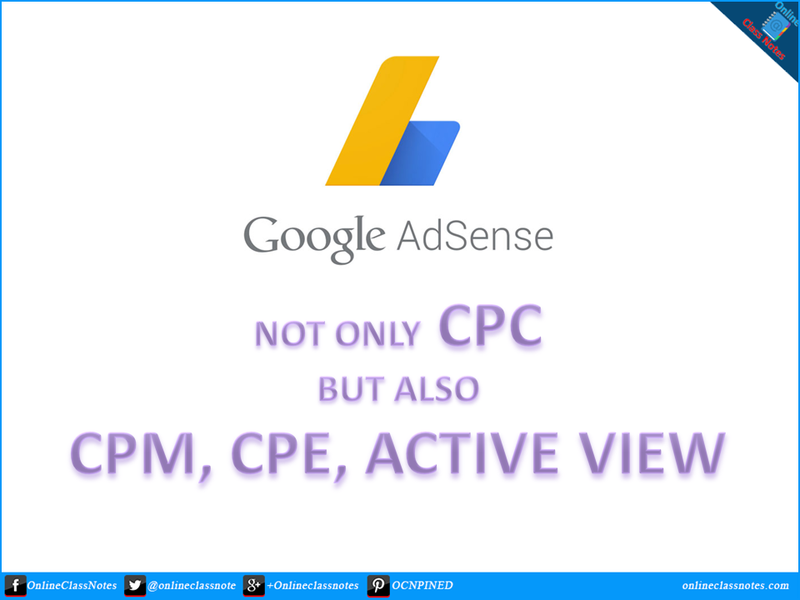 Adsense is not only a CPC network anymore, but also CPM, Active View CPM, CPE. Google's online advertising network adsense is generally known to most of us as a CPC (Cost per Click) advertising network. That is, a publisher earns money only when users clicks on the ads s/he is publishing. 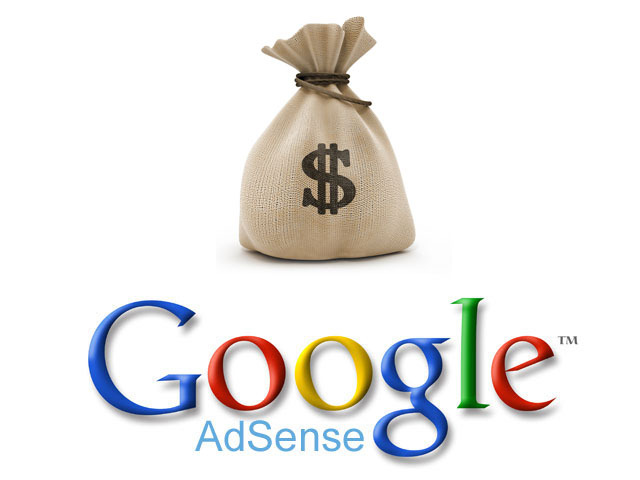 Adsense is a renowned advertising network both to ad publisher and advertiser due to various reasons, mostly because its from google. But, CPC started to generate less revenue as people started to get used to banner ads that google adsense offers. This is call banner blindness. People now can easily differentiate actual content from ads, no matter how much you customize the appearance of the ad (customizing text and link google adsense ads) using the available options from google adsense. So they ignore the ad and leave the page after they are done with the content. Ultimately resulting no revenue for the publisher, even from thousands of views! But, No Worries. 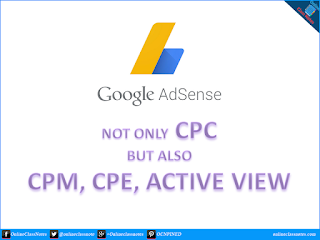 Google adsense now offer not only CPC, but also CPM, Active View CPM, CPE types of ads. And also not only banner ads, but also interstitial ad format for mobile, ads in google custom search, video ad etc. We will discus about different ad formats in another post. Today we will look at the different big types only. As its name implies, a publisher earns money when someone clicks on an ad. The amount a publishers earns depends on how much the advertiser wants to pay for a click on the ad. Again, this amount also vary with locations, that is, from which location (country, city etc.) the click was made. For example, an advertiser from America with ad of a product that generally gets sold in America, Canada, England etc. will obviously pay less when the click on the ad is made from a South Asian country. Anyway, this is how CPC works. Okay, so now we are talking. Do you have an website with 100k or more page-views a day? Then this is where you should look at. You get the bucks no matter if the ads were clicked on not. Awesome, right? Yes, but the things is Google Adsense won't let you choose the Bid Types for your ad placements. That is, you can't fix it that your ad placements will only show CPM ads. Its an automatic process from Google Adsense. For example, you may have 50k page views a day, out of this only 30k were monetized views (many user uses ad blockers to block ads from appearing), out of this 30k total recorded ad impressions were 70k. Now don't think that you have 70k CPM type impressions, this 70k also includes impressions for CPC and other types of ads. However, if you have 70k ad impressions in total, you can expect nearly 10k to be of CPM type. Now if you have $1 RPM (Rate Per Thousand Impressions), that means you already have $10 without any clicks. This is same as CPM types of ads with one added condition, the ads should also be viewed. Generally, an impression in CPM bid type is counted just when the ad is loaded, not a matter if the used actually viewed the ad or not. Active view means, the ad has to be loaded and viewed by the user to be counted as an impression. An web page can be tall enough that its not fitting on screen of the user's device. Now if an ad is at the footer section of the page and the user does not go to footer, the impression recorded for the ad won't be counted as an Active View impression. At least, 50% of the ad has to be on the screen to be counted as an Active View impression. This is like the Active View CPM with one added condition, the user should engage with the ad. Clicks? No, not clicks but some other ways. Such as hovering their mouse pointer over the ads for 2 seconds or more will tell google adsense that the user not only actively viewed the ad but also engaged with ad. This type of ads generally expands to larger sizes when hovered for a given amount of type.